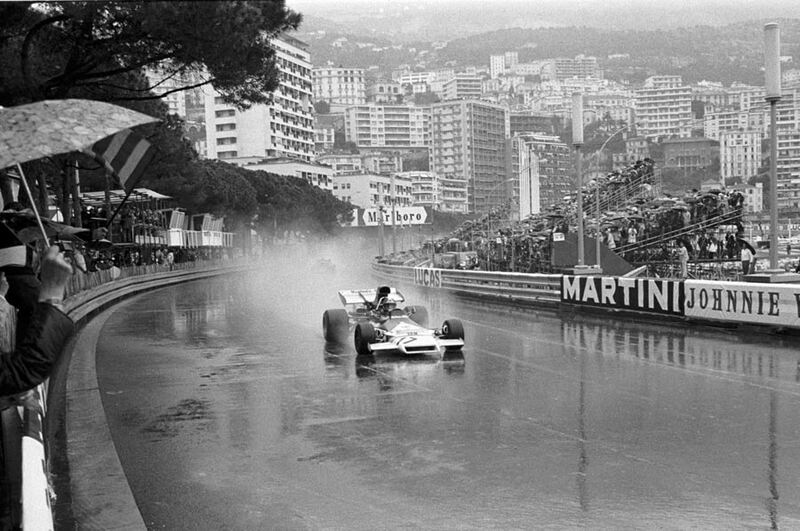 Thirty-five year old Jean-Pierre Beltoise recorded his first win in appalling conditions at the Monaco Grand Prix, leading an eventful race from start to finish. Making his comeback after a disastrous previous year with Matra, his win gave BRM their first points of the world championship. Torrential rain led to organisers allowing drivers an extra half-an-hour's practice ahead of the race, but that almost ended in tragedy as nobody had told Prince Rainier and Princess Grace whose car suddenly appeared on the circuit in front of them. Several drivers were forced to take evasive action before the royal couple were steered to safety. As had been the case in Spain a fortnight earlier, Emerson Fittipaldi took pole, and he was alongside Jacky Ickx, with Clay Regazzoni's Ferrari sharing the second row with Beltoise. On a surface left slippery by heavy rain in the hour before the start, and not helped by a car leaking lubricant all over the grid on the warm-up lap, Beltoise made a superb start to lead from Regazzoni with the two front row drivers slipping back to third and fourth. In those conditions, leading was a huge advantage and one Beltoise never squandered. He did relax during the race, and when he did so his lead quickly reduced and he was urged to step up his game by frantic signals from his pit crew. He also slid on numerous occasions, but maintained enough control to keep his car on the track. On the fifth lap, Regazzoni, lying second, braked too late and ran up an escape road, allowing Ickx through, and soon after Denny Hulme and Brian Redman did exactly the same thing. Mike Hailwood, who had shown tremendous pace in South Africa, again drove superbly to carve his way through the field before his car let him down. Jackie Stewart had also worked his way to within a second of Ickx when he braked too late at Mirabeau, briefly blinded by the spray, and clipped a barrier, distorting the Tyrrell's aerofoil. He then came together with Henri Pescarolo, before his engine began to misfire, and finally he hit a kerb and span again, but even so, he managed fourth place. Brian Redman came home fifth for McLaren, while Chris Amon rounded out the points in his Matra. Reggazoni's day finished when he careered into straw bales, while several other cars managed to finish with visible damage - Hulme and Ronnie Peterson both ended with badly-dented fronts.